Asked who she'd go out with on a date -- with any celebrity, living or dead -- and Sen. Hillary Rodham Clinton chose . . . a Republican. Her fantasy date would be with President Abraham Lincoln, Clinton said in an interview being published in the People magazine hitting newsstands Friday. The question: "If your husband gave you a pass for one night and you could go on a date with any celeb, alive or dead, who would it be?" Clinton's answer: "That's such a dangerous question! How about Abraham Lincoln?" Another surprising tidbit: Despite the 19-hour days she puts in on the trail, she's apparently never heard of the energy drink Red Bull. Asked if she's ever had one, she replied, "No. What is it?" Clinton, D-N.Y., also equivocates on a few either-or questions: She refused to choose between comedians Tina Fey and Amy Poehler, said she likes both wine and beer, and wouldn't select either "American Idol" or "Dancing With the Stars"; she said her mother -- who lives with the Clintons -- keeps her up to speed on both programs. She did, however, choose Weight Watchers over the South Beach Diet -- but didn't elaborate on her own eating habits. Except this didn't appear in People magazine. It appeared on ABC News' website. I'm coming around to the school of thought that the D.C. media aren't as infuriatingly shallow and insular as they appear to be; they're genuinely sick, sick in the way an alcoholic or a drug abuser knows he or she is sick, but feels powerless to repeat a destructive compulsion. Great piece by Susan Larson, books editor at The Times-Picayune, about the booksigning tent at this year's Jazz Fest...including the story of Hunter S. Thompson and the golf cart. Harry's shrewd, funny analysis of the video is well worth reading (and you've got to see the picture of Sister Souljones' high school graduation pic to believe it), but I'm not sure the vid was shot in South Central L.A., as he hypothesizes. It's certainly not Eugene, Ore. -- the palm trees in the background are pure L.A. -- but the tract houses in the background are more Brady Bunch than Watts (check the spiffy landscaping and the lack of bars on the windows). The biggest "tell" in the whole thing, though, is the fact that Jones/Seltzer just sits there for all 10 minutes of the video. I've seen a lot of these publishers' promos, and they usually involve an author walking around, telling stories from their memoirs on the sites where the stories occurred. Jones/Seltzer couldn't walk around and bring her story to life -- because it was an easily disprovable pack of lies. No street corner locations where she dealt rock; no battered-but-humble family home where "Big Mama" dished out neckbones and homespun wisdom in equal measure. So she just sits there like she was being interviewed on the Today show, a white woman in front of some well-kept houses, talking in vague generalities about education and "potential" and inspiration. It makes me wonder what it would take for Riverhead to have smelled a rat in this story -- or, indeed, in how much denial the publisher was willing to engage not to smell a rat. There's been much talk in recent years of how the White House Correspondents' Association's annual dinner has perhaps outlived its usefulness. Everywhere you turn, there's someone who used to make headlines, is making them now or will be. It's one of the biggest parades of the fabulously wealthy and famous you're ever likely to see. Where else outside Hollywood can you see Ben Affleck and Jennifer Garner, Martha Stewart, Marcia Cross and the Jonas Brothers gliding by your table? Anyway, The New York Times now refuses to confuse journalistic ethics with a Comedy Central roast (the paper refuses to buy a table at the charade any longer), and the general reaction at the D.C. lunch table seemed to be: Too good to sit with us? Who the hell does she think SHE is?. 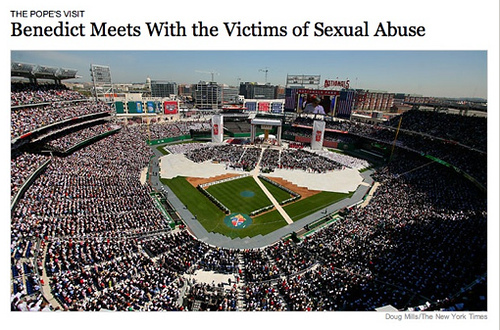 "Oh, the New York Times. The New York Times unfortunately did not buy a table. They felt, I just want to make sure I got this right, they felt this event undercut the credibility of the press. It's funny. You see, I thought that Jayson Blair and Judi Miller took care of that." That sound you hear is Craig Ferguson's sarcasm whizzing right over Frank James' head. You can enjoy James's stenography -- along with photos of Pamela Anderson, Karl Rove talking to Will.I.Am of the Black Eyed Peas, George Bush standing on a chair ("This got a lot of laughs and applause") and Colin Powell pointing at Jenny McCarthy's chichis -- on the Tribune's website. Brett and Judy: could you comment on Jazz Fest's policy of allowing Chinese crawfish to be served at a Louisiana festival? Do you agree with the policy and Festival Productions' rationale? Brett Anderson, Restaurant writer: I don't agree with the policy or rationale. The incentive to eat local products -- not just in Louisiana, but anywhere you happen to be -- is not just a matter of them being fresher and thus better tasting. The savings in this instance are not significant enough to rationalize shipping a product across the globe that we can get in our own back yard during a time of sky-rocketing fuel prices and environmental crisis. And then there's the issue of supporting local farmers and fishermen. They have struggled as much as any members of our community since Katrina. This is a community that nurtures many of the very traditions Jazzfest celebrates. I can understand wanting to keep prices low, but if the average Fest-goer can't be trusted to respect the circumstances surrounding slightly higher priced crawfish, who can? Judy Walker, Food editor: For those who don't know, Todd Price has a story in Offbeat this month that points out Chinese crawfish are used by some of the food vendors at Jazzfest. I heard Todd talk about this Sunday on the radio Sunday morning on Lorin's show. Very intriguing issue that opens several cans of worms. I think that in a perfect world every Jazzfest vendor would love to serve us only Louisiana products. But in a perfect world there also would be abundant inexpensive local crawfish. The vendors I have interviewed are quite sensitive to price issues. For example, they might serve a slightly smaller portion rather than raise the price. They also have close relationships with their vendors and work with them on prices. I can see all sides of this issue. As a consumer who is very aware of rising prices all around us, for gas and insurance and everything else, I don't want to spend a lot more money than usual on Jazzfest food. As a food editor who has interviewed Louisiana farmers and fishers, I can absolutely swear that local crawfish taste better, and we should do everything we can to support local farmers and fishers. And I can also appreciate the plight of somebody who is determined to bring a beloved product to Jazzfest without raising the price. It will be interesting to see if any of the vendors post signs to address this issue. Most of the vendors don't know me, so I just plan to ask about the source of their crawfish when I'm buying some. Would you be surprised to know that the crawfish you're eating is likely from China, not Louisiana? Matthew Goldman, the press and advertising director for Jazz Fest, counters that using local products exclusively no longer makes sense. "People from all over the world come here, we have bands from all over the world," he says, "and to think of specifying one item, and saying crawfish should only be from Louisiana, I think it is not the way of the world anymore." Goldman's logic is so cattywampus that it barely bears breaking down, but let's do it. "People from all over the world come here"...to eat Louisiana food, not Chinese substitutes. And if they're here to eat Louisiana food, then it should be made from Louisiana products. It's probably more efficient to feed the masses on Costco etouffée and Sam's Club beignets, but the thought is pretty damn sad. Would a Wisconsin Heritage Festival serve cheaper cheese because it was "only one item"? Would an Iowa Heritage Festival serve corn chowder made from Mexican corn? Moreover, if eating local food, supporting local farmers who are hanging on by a thread, and generally championing local excellence "is not the way of the world any more" to the poobahs at Jazz Fest, that's their right and their worldview...and a cheap one it is. Chinese vs. Louisiana crawfish isn't a new story; this New York Times article on the subject dates from 1997, and includes a note that the Jazz Fest wasn't doing it back then either. But that was 11 years ago, at a time when "eating locally" wasn't a mantra in fancy restaurants, hash joints, and the home table alike. Jazz Fest is still a wonderful confluence of music, food, and art -- but it's been a sacred cow for many years. Thou shalt not speak ill of the Jazz Fest, at least in print; when it comes to word of mouth, musicians, artists, and food vendors have had a lot to say about how it's been run. Few in the press have been willing to take 'em on. So I give props to Price for sticking out his neck on the topic (in a music magazine, no less), and to food writer Lorin Gaudin, who had him on her radio show last weekend to discuss the topic, where she did an on-air taste test of Louisiana vs. Chinese crawfish. I won't be at Jazz Fest this weekend -- I'll be at the Festival International in Lafayette, where I'm pretty sure they'd run you out of town if you dared use Chinese crawfish. I'm sure the food and music will be fine at Jazz Fest, but I've read the organizers' thoughts/rationalizations...and, frankly, they're just crawfishing. - I found Ethan Brown after his piece in Radar this month about the ongoing crime crisis in New Orleans. At first I hated it for the sensationalistic treatment and photos (including a photo caption of the sidewalk in front of my old house as "a notorious drug corner"). But I'm sure Brown had nothing to do with the windowdressing on the piece, which was smartly, tautly written, and his points were inarguable. Now I want to read his books. - Raving Black Lunatic is a reporter or editor at The Times-Picayune, and he is funny, smart, and a lot more uninhibited on his blog than he must be at the paper. I hope his overlords never find out his identity. Short of that, I wish they'd let him write like that at his day job, but the presses would explode. - And my mate Matt Davis, one of the most popular and beloved people at the Portland Mercury and in Portland, Ore. in general, now has an elegant site called Matt Davis Opens His Mouth. The public at large isn't likely to get it, which has always been Matt's problem, but fortunately he forges ahead, fueled by red wine and an unshakeable belief in his own superiority. The Daily News reported that the minister looked down at Eli Manning's hands during the ceremony and joked that they were "quite large." You know what they say...big hands, big passes. At the moment, it's been fixed...but it's not much better, to be honest.